Old Tappan Financial helped me navigate through a mess that my other insurance company had left me. They explained my business insurance options and was able to not only save me money but provide even more coverage than I had before. They did not hesitate to go over every question that I posed him and was very patient and understanding of the difficult position I had been in with the other company. I was so happy to have found Old Tappan Financial. Old Tappan Financial gives you something a little different. 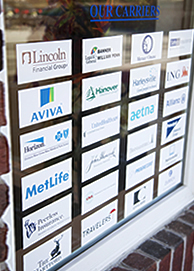 We're an independent broker that offers policies from over 40 major insurance carriers, all under one roof. We provide a wide variety of polices covering everything from life, auto, home, business and employee benefits. In the competitive world of insurance, choice does provide better policies and better prices, and we can prove it. With Old Tappan Financial, there's no need to waste time comparing prices and coverage, filling out forms, and dealing with multiple people. We make the experience easy and personal, while providing the best protection for your value. Multiple choices can be a overwhelming, especially with something as complex as insurance. At Old Tappan Financial, we get to know our clients needs for today, and tomorrow. We then help filter through the dozens of possible policies to find the ones that best suit your needs and budget. You'll see an itemized list of the top policies with the major details spelled out clearly so you can easily make comparisons. This helps give you the knowledge needed to make an educated decision. With Old Tappan Financial, you can expect personal, honest, and open discussions regarding your requirements. Old Tappan Financial was started by John Savadjian after 36 years of management experience at Prudential Insurance. His inside knowledge of the industry helps you, our client, navigate through the complexities of insurance to find the policy that's right for you. We also know which policies are the best value for our clients, and which ones aren't. Our objective is a long-term relationship, so your satisfaction is key. We also understand the careers and lifestyles of our Bergen County neighbors, and how insurance plays a key role in protecting them. Many of our clients have unique needs, such as large assets and valuables that go beyond the basic home and auto coverage. At Old Tappan Financial, we provide specialized policies for your valuables, while keeping your personal matters private and discrete. When you work with Old Tappan Financial, you get a personal agent that understands and represents you. Auto, home, life, and business insurance are all available through one simple contact. We are always there for you, starting with the initial sales and throughout the life of your policy. No need to keep several numbers for all of your policies at hand; one call to Old Tappan Financial is all it takes to get the answers you need.